"Coentrão" redirects here. For other uses, see Coentrão (disambiguation). This name uses Portuguese naming customs. The first or maternal family name is Silva and the second or paternal family name is Coentrão. Fábio Alexandre da Silva Coentrão (Portuguese pronunciation: [ˈfabju kwẽˈtɾɐ̃w̃]; born 11 March 1988) is a Portuguese professional footballer who plays for Rio Ave F.C. and the Portugal national team. Mainly a left back he can also operate as a left winger, and occasionally as a defensive midfielder. After starting playing professionally with Rio Ave, he signed for Benfica at 19, going on to be loaned several times before becoming an important member of the first team, as a left-back. In 2011, he joined Real Madrid. A Portuguese international since 2009, Coentrão represented the nation in two World Cups and one European Championship. Born in Vila do Conde, Coentrão joined hometown's Rio Ave F.C. in 2004 at the age of 16, playing three Primeira Liga games in the following season for a northern side that would be relegated. In 2006–07 he established himself as first-choice, as Rio Ave barely missed promotion back and had a good run in the Taça de Portugal, ended by Sporting CP with a 2–1 win in Lisbon; whilst playing for the club, he earned the nickname "Figo das Caxinas". After that season, where he was voted the divisions' Breakthrough Player of the Year, many clubs showed interest in Coentrão, most notably Sporting and S.L. Benfica, with him choosing the latter in July 2007. His playing style was likened to that of Arjen Robben by World Soccer Magazine, in its 50 World Talents 2007 issue. On 1 January 2008, having received insignificant playing opportunities at Benfica, Coentrão joined Madeira's C.D. Nacional on loan until the end of the season. On 3 May, he scored twice in a 3–0 away success against already crowned league champions FC Porto. In the summer of 2008, Coentrão transferred to Real Zaragoza, freshly relegated into Spain's Segunda División. After almost no appearances during the campaign, however, he returned to Portugal and Rio Ave in January 2009, still owned by Benfica; on 15 February he scored after an individual effort, albeit in a 1–3 loss at Porto. In late October 2009, Coentrão extended his contract with Benfica until 2015, with a release clause of €30 million. On 2 December, having played some matches for Benfica as a left back, he scored his first goal in European competition, against FC BATE Borisov of Belarus in a 2–1 away win in the UEFA Europa League group stage. On 10 February 2010, Benfica sold 20% of Coentrão's economic rights on any future transfer to a third party owner, Benfica Stars Fund, along with other teammates. He was tagged at €15 million, with the fund paying €3 million. During that season, he had a breakthrough year, appearing in a total of 43 official games (2,851 minutes), as the club won the league and the Portuguese League Cup; he ended the season in style, as he was voted Portuguese League Breakthrough Player of the Year. On 27 September 2010, fully established with both his club and the national team, 22-year-old Coentrão extended his contract with Benfica until 2016. On 2 November he scored his first career brace, helping to a 4–3 home win over Olympique Lyonnais for the season's UEFA Champions League group stage – in a 67-minute fast break, he combined with Carlos Martins to make it 4–0 for the hosts. On 5 July 2011, after extensive negotiations, Benfica and Real Madrid reached an agreement in principle over the transfer of Coentrão, who signed a six-year contract the same day for €30 million – Ezequiel Garay went in the other direction as part of the deal. He made his debut in a pre-season friendly against the Los Angeles Galaxy on the 16th, creating an assist for Karim Benzema. His first two official games were against FC Barcelona for the Supercopa de España: in the first leg, he came on as a substitute for Sami Khedira in the second half of a 2–2 home draw and played as a defensive midfielder, and he started as left back in the second match, a 2–3 loss at the Camp Nou. 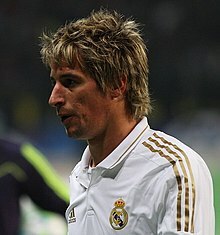 Coentrão made his La Liga debut on 28 August 2011 against former club Zaragoza, appearing as a central midfielder in a 6–0 away win (90 minutes played). While he featured mostly in these positions, he was also deployed by manager José Mourinho as a right back, against Sporting de Gijón on 3 December and against Barcelona the following week, winning the league in his first year. In the last minutes of the second matchday in the 2012–13 season, Coentrão was sent off after insulting referee Pérez Lasa whilst on the substitutes bench, in an eventual 1–2 loss at Getafe CF. He subsequently received a four-match ban. Coentrão scored his first goal with Real Madrid on 16 December 2012, netting after a Cristiano Ronaldo pass to help the hosts come from behind against RCD Espanyol, as the game eventually ended 2–2. On 2 September of the following year, Manchester United launched a late loan bid for him on transfer deadline day. It was accepted by the Spaniards, but the deal fell through when they failed to secure a replacement in Guilherme Siqueira from Granada CF, who subsequently joined Benfica on loan. Coentrão started the play that led to Gareth Bale's individual effort for the 2–1 winner in the final of the Copa del Rey against Barcelona. He also started both legs of the Champions League semi-final against holders FC Bayern Munich as Real Madrid dismantled the opposition 5–0 on aggregate en route to their tenth European title, La Décima. Still under manager Carlo Ancelotti, Coentrão was sparingly played in the 2014–15 campaign mainly due to injuries, with only five league starts out of nine appearances. On 26 August 2015, it was announced he was loaned to AS Monaco FC in a season-long move. He made his competitive debut against Gazélec Ajaccio on 13 September, replacing Adama Traoré in an eventual 1–0 away win, and scored his first goal for his new team 11 days later to help the visitors come from behind at Montpellier HSC to win it 3–2. As Madrid won the league championship in 2016–17, in which Coentrão contributed with just three appearances. He himself admitted not being fit enough to represent the club; in the season's Champions League he appeared in two group stage games, and his team won the competition for the second consecutive time. On 5 July 2017, Coentrão was loaned to Sporting in a season-long move, despite having stated that in Portugal he would only play for Benfica. After terminating his contract with Real Madrid, Coentrão signed with Rio Ave for one season on 31 August 2018. An international for Portugal at youth level, Coentrão was voted MVP in the 2007 Madeira Cup for the under-20 team, also being crowned the competition's top scorer. Subsequently, he represented the nation in the 2007 FIFA U-20 World Cup and, also during that year, made his under-21 debuts. After consistent performances at Benfica, although he started rarely in the early 2009–10, Coentrão earned his first senior call-up in November 2009, for the decisive 2010 FIFA World Cup qualification playoffs against Bosnia and Herzegovina, and made his debut in the first leg on 14 November at the Estádio da Luz, playing 21 minutes in the 1–0 win. Coentrão was chosen for Carlos Queiroz's squad of 23 for the final stages, starting as left-back ahead of another adapted player, Duda. He played in all the matches in South Africa, in an eventual round-of-16 exit. On 10 August 2011, Coentrão scored his first international goal, netting through a rare header in a 5–0 win over Luxembourg. He played all the games and minutes at UEFA Euro 2012, acting as left-back for the semi-finalists. Coentrão suffered an injury in the second half of Portugal's first game at the 2014 World Cup, against Germany, and was ruled out for the remainder of the tournament. He played a key role in a 2–1 home win over Serbia on 29 March 2015, which put them top of the Euro 2016 qualifying group, crossing for the opening goal by a Ricardo Carvalho header and then scoring the winner from João Moutinho's pass. Coentrão missed Euro 2016, which Portugal won, due to a thigh injury, contracted in training with Monaco. He returned to action after 697 days for a 2018 World Cup qualifier against Hungary, but was stretchered off in the first half of an eventual 1–0 win in Budapest. Coentrão was named in a preliminary 35-man squad for the 2018 World Cup in Russia, but he did not make the final cut. 1 Includes Supercopa de España and Supertaça Cândido de Oliveira. 2 Includes UEFA Super Cup and FIFA Club World Cup. ^ "Juventus target Benfica winger Fabio Coentrao – Report". Goal. 23 June 2010. Retrieved 14 October 2014. ^ "Blackburn following Benfica winger Fabio Coentrao". Tribal Football. 23 June 2010. Retrieved 14 October 2014. ^ "Fábio Coentrão: "Pena ter sido tão pouco tempo"" [Fábio Coentrão: "Too bad it was so little time"]. Record (in Portuguese). 18 October 2005. Archived from the original on 31 May 2014. Retrieved 30 May 2014. ^ "Sporting segue em frente na Taça" [Sporting go through in Cup]. Correio da Manhã (in Portuguese). 21 January 2007. Retrieved 7 April 2018. ^ "Coentrão, a redenção do "Figo de Caxinas"" [Coentrão, the redemption of the "Figo from Caxinas"] (in Portuguese). SAPO. 10 May 2010. Retrieved 7 April 2018. ^ "Fábio Coentrão já trabalhou na Madeira" [Fábio Coentrão already working in Madeira]. Record (in Portuguese). 2 January 2008. Archived from the original on 31 May 2014. Retrieved 30 May 2014. ^ "Fábio Coentrão: "'Espetar' 3–0 no Dragão é bom"" [Fábio Coentrão: "'Handing out' 3–0 at the Dragão is good"]. Record (in Portuguese). 3 May 2008. Archived from the original on 31 May 2014. Retrieved 30 May 2014. ^ "Coentrao, el tercer fichaje" [Coentrao, the third signing]. Heraldo de Aragón (in Spanish). 18 July 2008. Retrieved 30 May 2014. ^ "Coentrao deja de ser jugador del Zaragoza" [Coentrao is no longer a Zaragoza player]. Diario AS (in Spanish). 10 January 2009. Retrieved 30 May 2014. ^ "Fábio Coentrão confirmado" [Fábio Coentrão confirmed]. Record (in Portuguese). 5 January 2009. Archived from the original on 2 April 2015. Retrieved 30 May 2014. ^ "FC Porto-Rio Ave, 3–1 (Lucho 37' gp, Farías 86', 89'; Fábio Coentrão 72')" [FC Porto-Rio Ave, 3–1 (Lucho 37' pk, Farías 86', 89'; Fábio Coentrão 72')]. Record (in Portuguese). 15 February 2009. Retrieved 30 May 2014. ^ "Comunicado" [Announcement] (PDF) (in Portuguese). Portuguese Securities Market Commission. 29 October 2009. Retrieved 6 July 2011. ^ "BATE run aground as Eagles soar". UEFA. 2 December 2009. Retrieved 1 July 2010. ^ "Comunicado" [Announcement] (PDF) (in Portuguese). Portuguese Securities Market Commission. 10 February 2010. Retrieved 5 July 2011. ^ a b "Rosa Mota e Carlos Lopes recebem Prémio Fernando Soromenho" [Rosa Mota and Carlos Lopes receive Fernando Soromenho Award] (in Portuguese). CNID. 25 May 2010. Archived from the original on 24 March 2012. Retrieved 27 May 2010. ^ "Comunicado" [Announcement] (PDF) (in Portuguese). Portuguese Securities Market Commission. 27 September 2010. Retrieved 5 July 2011. ^ "Fabio Coentrao signs new deal at Benfica". Goal. 27 September 2010. Retrieved 28 September 2010. ^ "Coentrão inspires Benfica revival". UEFA. 2 November 2010. Archived from the original on 5 November 2010. Retrieved 17 April 2011. ^ "Madrid confirm Coentrão transfer from Benfica". UEFA. 5 July 2011. Retrieved 5 July 2011. ^ "Comunicado" [Announcement] (PDF) (in Portuguese). Portuguese Securities Market Commission. 5 July 2011. Retrieved 31 December 2014. ^ "Real Madrid sign fullback Coentrao from Benfica". Reuters. 5 July 2011. Archived from the original on 10 July 2012. Retrieved 13 July 2011. ^ "Real Madrid tops LA Galaxy 4–1 in World Football Challenge opener". Neon Tommy. 17 July 2011. Retrieved 26 December 2014. ^ "Coentrão y el vertigo" [Coentrão and vertigo]. El País (in Spanish). 20 August 2011. Retrieved 9 October 2015. ^ "Ronaldo gets Madrid show underway". ESPN Soccernet. 28 August 2011. Retrieved 2 September 2011. ^ "Albin denies Madrid at the death". ESPN Soccernet. 16 December 2012. Retrieved 16 December 2012. ^ "Manchester United: Fabio Coentrao move fails". BBC Sport. 3 September 2013. Retrieved 3 September 2013. ^ "Real Madrid 2 Barcelona 1, Copa del Rey final: match report as Gareth Bale scores wonder winner". The Daily Telegraph. 17 April 2014. Retrieved 9 October 2015. ^ "Sergio Ramos and Cristiano Ronaldo roll Real Madrid past Bayern Munich". The Guardian. 29 April 2014. Retrieved 9 October 2013. ^ "Coentrao, el regreso del hombre ausente" [Coentrao, the return of the absent man]. El Mundo (in Spanish). 11 August 2015. Retrieved 9 October 2015. ^ "Coentrão deal agreed". AS Monaco. 26 August 2015. Retrieved 26 August 2015. ^ "Official announcement: Coentrão". Real Madrid. 26 August 2015. Retrieved 26 August 2015. ^ "Face au Gazélec Ajaccio, Monaco a eu chaud mais il regoûte à la victoire (1–0)" [Against Gazélec Ajaccio, Monaco sweated but enjoy win (1–0)] (in French). Eurosport. 13 September 2015. Retrieved 24 July 2016. ^ "Montpellier 2–3 Monaco: Fabinho's late spot-kick helps seals visitors' comeback". Sky Sports. 24 September 2015. Retrieved 9 October 2015. ^ "Cada minuto de jogo de Coentrão custa 53 mil euros ao Real Madrid" [Every minute of play for Coentrão costs Real Madrid 53 thousand euros] (in Portuguese). Mais Futebol. 21 March 2017. Retrieved 22 May 2017. ^ "Real Madrid: Coentrão titular, cinco meses depois" [Real Madrid: Five months later, Coentrão starts] (in Portuguese). Mais Futebol. 15 April 2017. Retrieved 22 May 2017. ^ "Fábio Coentrão: "Não estou em condições para jogar pelo Real Madrid"" [Fábio Coentrão: "I am in no condition of playing for Real Madrid"] (in Portuguese). SAPO. 29 March 2017. Retrieved 22 May 2017. ^ "Legia Warsaw 3–3 Real Madrid". BBC Sport. 2 November 2016. Retrieved 6 June 2017. ^ "Sporting Lisbon 1–2 Real Madrid". BBC Sport. 22 November 2016. Retrieved 6 June 2017. ^ "Majestic Real Madrid win Champions League in Cardiff". UEFA. 3 June 2017. Retrieved 4 June 2017. ^ "Comunicado Sporting Clube de Portugal – Futebol, SAD" [Sporting Clube de Portugal announcement – Football, PLSC] (in Portuguese). Sporting CP. 5 July 2017. Retrieved 5 July 2017. ^ "Official announcement: Coentrão". Real Madrid. 5 July 2017. Retrieved 5 July 2017. ^ "Fábio Coentrão: "Em Portugal só jogo pelo Benfica"" [Fábio Coentrão: "In Portugal I only play for Benfica"]. Diário de Notícias (in Portuguese). 5 June 2015. Retrieved 5 July 2017. ^ "Coentrão pode lamentar ter dito que só jogaria no Benfica" [Fábio Coentrão might regret having said that he would only play for Benfica] (in Portuguese). Rádio Renascença. 6 June 2017. Retrieved 5 July 2017. ^ ""Tenho de voltar ao clube da minha terra para ser feliz"" [“I have to return to my home club to be happy”] (in Portuguese). Rio Ave F.C. 31 August 2018. Retrieved 31 August 2018. ^ "Official announcement: Coentrão". Real Madrid C.F. 31 August 2018. Retrieved 31 August 2018. ^ "Portugal take slight advantage over Bosnia-Herzegovina to World Cup play-off second leg". The Daily Telegraph. 16 November 2009. Retrieved 9 October 2015. ^ "FIFA's 289-page technical report on the 2010 World Cup – in 15 points". Zonal Marking. 3 September 2010. Retrieved 8 June 2016. ^ "Portugal routs Luxembourg 5–0 in friendly". Fox Sports. 10 August 2011. Retrieved 7 April 2018. ^ "Spain survive test of nerve to reach final". UEFA. 27 June 2012. Retrieved 8 June 2016. ^ "Muller-inspired Germany thrash ten-man Portugal". FIFA. 16 June 2014. Retrieved 18 June 2014. ^ "Portugal lose Fabio Coentrão and Hugo Almeida for rest of group stage". The Guardian. 17 June 2014. Retrieved 26 June 2014. ^ "Portugal see off Serbia to top Group I". UEFA. 29 March 2015. Retrieved 29 March 2015. ^ "Monaco, Portugal defender Fabio Coentrao set to miss Euro 2016". ESPN FC. 15 April 2016. Retrieved 8 June 2016. ^ "Seleção: o regresso de Fábio Coentrão, 697 dias depois" [National team: the return of Fábio Coentrão, 697 days later] (in Portuguese). Mais Futebol. 3 September 2017. Retrieved 3 October 2017. ^ "Hungary 0–1 Portugal". Sky Sports. 3 September 2017. Retrieved 3 October 2017. ^ "Revealed: Every World Cup 2018 squad – 23-man & preliminary lists & when will they be announced?". Goal. 17 May 2018. Retrieved 17 May 2018. ^ Fábio Coentrão at Soccerway. Retrieved 4 October 2015. ^ "Fábio Coentrão". ESPN FC. Retrieved 16 January 2014. ^ a b "Fábio Coentrão". EU-Football.info. Retrieved 10 August 2018. ^ a b c Fábio Coentrão at Soccerway. Retrieved 24 December 2014. ^ "Aves ganha a Taça de Portugal graças a bis de Guedes" [Aves win Portuguese Cup thanks to Guedes brace]. O Jogo (in Portuguese). 20 May 2018. Retrieved 20 May 2018. ^ "Simão Sabrosa eleito o melhor jogador da Bwin Liga" [Simão Sabrosa elected best player of Bwin League]. Record (in Portuguese). 4 June 2007. Retrieved 25 January 2015. ^ "Cinco españoles aparecen en el once ideal de 2010 de L'Equipe" [Five Spaniards in the ideal eleven of 2010 by L'Equipe]. Marca (in Spanish). 25 December 2010. Retrieved 24 January 2015. ^ "Coentrão eleito Jogador do Ano na gala do 107º aniversário do Benfica" [Coentrão elected Player of the Year in Benfica's 107th anniversary gala]. Jornal de Notícias (in Portuguese). 1 March 2011. Retrieved 1 March 2016. ^ "UEFA Euro 2012 Team of the Tournament". UEFA. 2 July 2012. Retrieved 24 January 2015. Wikimedia Commons has media related to Fábio Coentrão.